Learn about all the kinds of chocolate tasting terms and words to describe gourmet chocolate with our comprehensive glossary definitions. Dutch process powders which have been treated with alkali. They range from very light reddish-brown to dark reddish-brown in color, and mild cocoa flavor to strong cocoa flavor. Amenolado cocoa is the only variety of forastero cacao that is delicate and mild-flavored... most are harsh and bitter. It’s derived from the Arriba bean. The name for a variety of forastero cacao beans cultivated in Ecuador which produce a delicate, mild-flavored cocoa, considered to be one of the world’s best. A province in eastern Brazil that gives its name to a hybrid of the forastero cacao bean. Bahia beans have a strong flavor and are usually blended with other beans. The French term for water bath. A bain marie is the equivalent to a double boiler. It melts chocolate gently over warm water so it will not burn. Non-alcoholic unsweetened chocolate liquor in solid form used as a baking ingredient. This chocolate is pure, unsweetened, sometimes bitter chocolate liquor, pressed from the cacao bean. Baking chocolate usually has lecithin added, which acts as an emulsifier, and vanilla, for flavoring. Another hybrid of the forastero cacaco bean cultivated in Ecuador. Balao malacha beans are always blended with other beans... their flavor is not desirable when unblended. The French word for a small, elegant box of chocolates designed to prevent the chocolates from damaging each other. In 1912 Louise Agostini, wife of the grandson of the founder of Neuhaus Chocolates created the ballotin. First chocolate liquor is pressed from the cacao bean during processing, then cocoa butter, a small amount of sugar, vanilla, and usually lecithin are added. Bittersweet chocolate has a deep, strong, tangy and slightly sweet flavor. It is used for making all types of desserts, pastries, and confections. Some like to eat it as is. Bittersweet chocolate is also made as couverture (coating) chocolate. Because it has more cocoa butter than regular chocolate, and is used by professionals to produce thin outer coatings on cakes, truffles.and other confections. Couverture chocolate must be tempered to stabilize the cocoa butter. The Aztec word for cacao bean ... the word chocolate is a derivative. The tropical evergreen tree and its dried and partially fermented beans that are processed to make chocolate, cocoa powder, and cocoa butter. A name given by the Spanish to the criollo variety of cacao bean when it was first brought to Europe. When the cacao butter in chocolate separates out from the other ingredients, floats to the top, and crystallizes, it appears as white dots and streaks, or as a dull, gray film on the chocolate. This is only a cosmetic effect and does not mean that the chocolate is spoiled. The cacao butter will blend in when the chocolate is melted. This condition is also called fat bloom. A bitter liquid or paste produced when cacao beans are roasted and ground, and usually used as a baking ingredient. The chocolate liquor is cooled and molded into blocks (unsweetened baking chocolate). The liquor and blocks contain roughly 53% cacao butter. Chocolate modeling paste can be made with dark, white, or milk chocolate by mixing it with corn syrup. It’s pliable and has a malleable texture, similar to marzipan.. Ribbons, ruffles, flowers, leaves, and stems can be cut and fashioned from thinly rolled out chocolate modeling paste to decorate desserts, pastries, and other confections. This specially designed thermometer is a critical tool when you are tempering chocolate since extreme accuracy is necessary. The slim, glass mercury thermometer has distinct markings and reads in 1-degree graduations in the range of 40degrees Fahrenheit to 130degrees Fahrenheit. Located in Barcelona, Spain, Chocovic makes a line of three dark couverture varieties, that are unsual since they are each made from single origin fine grade cacao beans, labeled “Origen Unico.” This means that the beans are all one variety (not blended) and that they are all grown in the same area. Is the name of an isolated plantation located in Venezuela which dates back to the seventeenth century. They grow one of the world’s most highly prized, flavorful varieties of the criollo cacao bean. These beans are rare and are usually blended with other beans before they are shipped to the market. After some or most of the fat has been removed with a hydraulic press, the remaining solid materials which include the flavoring and coloring components of chocolate liquor. The source of all chocolate... cacao beans are found in the pods of the cacao tree, Theobroma cacao, an evergreen typically grown within 20° of the equator. The natural, cream-colored vegetable fat extracted from cacao beans by using a hydraulic press to extract it from chocolate liquor. Cacao butter adds smoothness and flavor and is the main ingredient in white chocolate. Also called presscake, cocoa cake is a fairly dry, solid cake, which is what is left over after hydraulic presses extract the cacao butter from chocolate liquor. Cocoa cakes are crushed, ground, and sifted to produce cocoa powder. In Trinidad and some regions of South America the women shuffle through the cacao beans when they are spread out to dry. By continually turning them, this ritual ensures the beans will dry evenly, it removes extra particles, and also polishes the beans. The cocoa dance is performed twice a year after the cacao beans are harvested. Once cacao beans are fermented, dried, roasted and cracked, the nibs (center of the cocoa bean) are ground to extract about half the cacao butter, leaving a dark brown paste called chocolate liquor. After drying again, the hardened mass (press cake) is ground into unsweetened cocoa powder which may be natural or Dutch processed. It’s available in different fat levels and a range of tastes include, mild to strong, and unsweetened, and it’s used for baking, reduced fat and calorie recipes, and ice cream flavoring. A coating material similar to, but it is not chocolate. It is created with domestic or imported fats, not cacao butter. A term describing professional quality coating chocolate that is extremely glossy. It usually contains a minimum of 32% cocoa butter, which enables it to form a much thinner shell than ordinary confectionary coating. Couverture is usually only found in specialty candy making shops. You often find it as the chocolate that surrounds chocolate covered fruits, or as the shell of fancy filled chocolates. Sugar crystals are formed during the process of cooking sugar when the particles stick together because the liquid they are mixed with is saturated to its fullest point and cannot absorb any more sugar. Whether fudge has a grainy or smooth texture is determined by controlling the sugar crystallization. If the mixture is stirred while warm, large crystals form and produce a grainy texture. If it is stirred when cool, small crystals form, resulting in a smooth texture. Sugar crystallization also occurs when moisture accumulates on the surface of chocolate and the sugar is drawn up. This condition is called sugar bloom, which is visible as white streaks and dots and grainy texture. It is not the same as chocolate bloom. Its Latin name is Theobroma grandiflorum (it’s related to cacao), and is native to the Amazon rain forest of Brazil. A cupuacu pod is about the size and shape of a football, with skin like a kiwi fruit. The seeds are buried in the moist pulp of the fruit inside the pods. The seeds are dried, then processed like cacao beans to producer a light-colored chocolate that has a mellow, mild bittersweet flavor with fruity undertones. Cocoa butter is present in cupuacu as it is in chocolate. Cupuacu is processed into both powder and bars and is used in the same way as cocoa powder and chocolate. A chocolate flavored product that derives most of its flavor from cocoa butter rather than chocolate. An alkaline treatment of the nib prior to grinding, or the liquor prior to pressing. This process darkens the resultant chocolate liquor or cacao and modifies the chocolate flavor, helping to neutralize cacao's natural acidity. A treatment of the chocolate product with alkali. The process of coating candies and confections with chocolate in a specially designed machine. A machine, which receives lines of assorted centers (nuts, nougats, fruit or whatever desired filling) and showers them with a waterfall of liquid chocolate. Other confectionery machines create a hallow-molded shell of chocolate, which is then filled with a soft or liquid center before the bottom is sealed with chocolate. Fondant chocolate has become the standard for modern, high-quality chocolate because it is extremely smooth and palatable. The invention of the conching machine by Rodolphe Lindt in 1879 and his experiments of adding cocoa butter to chocolate liquor created chocolate with a velvety smooth, fluid texture that has no trace of bitterness. One of the three main types of cacao beans used to make chocolate, forastero beans originated in the upper Amazon. Forastero cacao is hearty and produces high yields, which account for approximately 90 percent of the world’s crop. Forastero cacao is widely grown in Africa, the West Indies, and Central and South America. Because its flavor is strong and bitter it is most often blended with other beans. As with the other two main types of cacao beans, forastero beans have several hybrids and varieties, many of which are named by their places of origin. Ganache is made with varying proportions of chocolate and cream... more chocolate than cream yields a firm ganache, whereas more cream than chocolate makes a softer more velvety mixture. 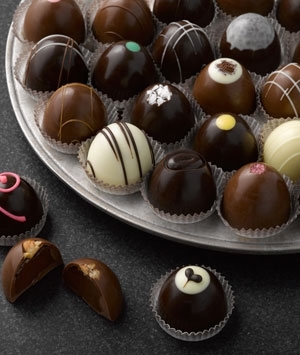 Ganache has many uses... centers for truffles, fillings for cakes and tarts, and in its liquid state it is poured over cakes and pastries for a glaze. Ganache can be flavored with liqueurs and extracts, or combined with soft, beaten butter to create ganache beurre. Also called ganache soufflé, is made by adding butter to ganache and beating until light and fluffy. It is used to fill and frost cakes, and as a filling for tarts and other pastries. Gianduia was originally created in Turin, the Piedmont region of Italy, and the home of famous Italian hazelnuts. It is a commercially blended mixture of roasted hazelnuts and/or almonds, and chocolate and has a velvety smooth texture. Although milk chocolate is most commonly used today, it was originally made with cocoa powder. It is also occasionally made with dark chocolate. Once tasted, Gianduia is impossible to forget... its flavor is so subtle that it is impossible to pick out the separate ingredients. Use it to flavor a wide variety of desserts, pastries, and confections, including ice cream. The name Gianduia is given to a group of candies and confections made with a combination of hazelnuts and chocolate. Guayaquil beans have a sweet flavor that blends well with other beans. They are a variety of the trinitario cacao beans grown in western Ecuador. A brand of Mexican sweet chocolate used primarily for making hot chocolate. The chocolate is sold in the form of 3-inch round tablets that are packaged in octagon-shaped, cylindrical, bright yellow and red cardboard boxes. Ibarra chocolate is available in the imported food section in many supermarkets and specialty food shops. It is made with vegetable oil rather than cacao butter, it doesn't deliver either the same texture or flavor as regular unsweetened chocolate. It was developed for baking, is unsweetened, comes in individual 1 ounce packages and requires no melting. A hand tool used by inspectors on plantations in Africa to open cacao pods lengthwise so the cacao beans can be classified into various grades by their appearance. The magra has a blade that is suspended in a frame, which drops swiftly to open the pods. Maragnan beans, variety of the forastero cacao bean, have a strong flavor that is favored for blending with other beans. The are grown in Brazil. The concave curved stone slab used by the Aztecs to grind shelled cacao beans to paste. The same method was used in Europe until the late nineteenth century. Cacao butter, milk, sweeteners and flavorings that are added to chocolate liquor. Milk chocolate lends itself to good use for garnishes and candy coatings. All milk chocolate made in the U.S. must contain at least 10% chocolate liquor and 12% whole milk. A scrumptious flavor made by combining chocolate and coffee that is used extensively in desserts, pastries, and confections. A classic Mexican dish composed of turkey in a spicy, savory chocolate sauce. It is reputed to have been invented by the nuns of Puebla near Mexico City. Also called molinet, this wooden tool was developed by the Spanish in the sixteenth century. When the French created chocolate pots in the seventeenth century, their lids were made with a center hole to hold a molinillo to stir the chocolate. At one end it is fat and round with several deep carved grooves. To use a molinet you twist it in your hands in a back-and-forth motion to beat the chocolate drink and make it frothy. This cacao bean is also called arriba, the name for a variety of forastero cacao bean cultivated in Ecuador. It produces a light, delicate, and flavorful cocoa, considered to be as good as the world’s best. Non-alkalized chocolate liquor or cocoa processed without an alkaline treatment. The inner almond shaped seed of the cacao bean. The nibs are exposed after the outer shells of the cacao bean have been removed. Nibs are roasted, then ground to produce chocolate liquor, from which all chocolate products are made. Natural process powders, manufactured without the use of alkali, ususally yellowish-brown color; fruity, acidy flavor. A variety of forastero cacao bean cultivated in the Brazilian state of the same name. A brand of premium quality chocolate and couverture used by professionals. Product that remains after most of the cocoa butter has been pressed from the chocolate liquor. Press cake is pulverized to make cocoa powder. The mythical plumed serpent god worshiped by the Aztecs. Quetzalcoatl provided his people with cacao, which they considered to be divine. He was supposed to return to earth in the year “one reed” and bring the treasures of paradise. When Cortes landed in the sixteenth century, in the year “one-reed,” he was mistakenly thought to be Quetzalcoatl and warmly welcomed by Montezuma, the Aztec ruler. This ultimately led to the enslavement and destruction of the Aztec people by the Spanish. A method of stabilizing the cocoa butter in chocolate so the chocolate has a shiny, even appearance and smooth texture. Finely chop the chocolate to be tempered and melt two thirds of it in the top of a double boiler over low heat. Stir often with a rubber spatula so it melts evenly. Remove the top pan from the water and wipe very dry. Stir in the remaining third finely chopped chocolate in two or three stages until smooth. To check for the right temperature, place a dab under your lower lip. It should feel comfortable. The specially designed tinned-steel or aluminum baking pan created to shape the classic Austrian “mock saddle of venison” cake. It looks like a long loaf pan that is curved in a half-moon shape and has deep, evenly spaced grooves across the width. Some versions of the pan also have a groove down the center to represent the bone of the saddle of venison. The cake is recognized by its classic curved, ridged shape, which it takes from the pan. A typical Rehrucken Mold measures between 10 and 15 inches long, 4.5 inches wide, and 22.5 inches deep. The German word for whipped cream, which is the traditional accompaniment to many chocolate pastries and desserts. chocolate liquor with additional sweeteners and cacao butter. It is also known as dark chocolate. According to United States standards, it must contain at least 35% chocolate liquor. Its fat content averages 27%. A technical term that describes one of the characteristics of well-tempered chocolate. It should break cleanly and crisply, with a sharp snap and should not be crumbly or soft. A white crust of sugar crystals that forms when moisture accumulates on the surface of chocolate and chocolate candies. The moisture draws the sugar to the surface where it dissolves. This is visible as white streaks and dots and causes a grainy texture. Storing loosely wrapped chocolate and candies in the refrigerator where they are exposed to too much moisture causes sugar bloom. It is not the same as chocolate bloom, which occurs when the cacao butter in the chocolate rises to the surface. Contains more sweeteners than semi-sweet chocolate and at least 15% chocolate liquor. Sweet chocolate is used mostly for decorating and garnishing. The fat content is similar to semi-sweet chocolate. A process that sets cacao butter at its most stable point. Cacao butter has four different types of crystals and each has a different melting point. Tempering chocolate captures the beta crystal, the most stable of the four. Because chocolate has these different melting points it is unstable and causes the cocoa butter to easily rise to the surface of chocolate. This creates a condition called chocolate bloom, which results in unsightly white and gray streaks and dots, a grainy texture, and makes unmolding difficult. When chocolate is tempered it has a shiny, even appearance and smooth texture. It breaks with a sharp snap, sets up rapidly, and releases easily from molds. All chocolate comes from the manufacturer tempered, but when it is melted it loses the temper and must be tempered again for dipping and molding. To temper chocolate, it is heated so it melts completely, stirred to cool to approximately 78 degrees Fahrenheit, then heated again to an exact temperature, depending on the type of chocolate it is... dark, milk, or white. Tempering is accomplished through different methods and by machine. A species of the genus Theobroma, grown in the Amazon rain forest in Brazil, also called cupuacu. The product of this fruit is a light colored chocolate that has delicate, mild bittersweet flavor, with fruity undertones. Torrone is an Italian confection made with honey, egg whites, toasted almonds, pistachios, and other nuts, such as hazelnuts. Chocolate torrone can be made by adding chocolate, and chocolate-dipped torrone is often available. A dense, moist, fuggy, flourless chocolate cake that is a specialty of the town of Vignola near Modena, Italy. According to legend during the Renaissance, Pastry Chef Eugenio Gollini invented Torta Barozzi in 1897 to celebrate the birthday of the architect Jacopo Barozzi. A native of Vignola, Barozzi created the concept of a spiral staircase. It is said that Gollini’s descendants still make the cake today, but have taken the family vow to never disclose the recipe. Although the ingredients are printed on the box, the proportions and the ways in which they are combined are not. The cake contains peanuts, a very unusual ingredient for Italy, but the family offers no explanation for how they became part of the cake. Three layers of rich gianduia cake, filled and frosted with a creamy gianduia ganache cream... and of course the cake is decorated with ground and toasted hazelnuts! An Italian delight renowned throughout the Piedmont region, where hazelnuts are grown. A special cup for chocolate drinks, created in the early eighteenth century to prevent the beverage from spilling. At that time chocolate was so expensive, only the privileged could indulge. The trebleuse is placed in a holder, in the center of a saucer that keeps it erect and steady. 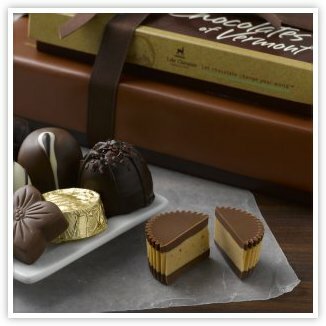 A cold molded dessert in three layers, each flavored separately with dark chocolate, milk chocolate, and white chocolate. It can be made of a creamy, velvety mousse, ice cream, or custard, and is generally molded in a glass loaf pan. When it is unmolded and sliced across the width, the three distinct chocolate layers show. Trichocolate Terrine is usually served with a fruit or custard sauce. One of the three main types of cacao beans used to make chocolate, trinitario beans are a cross between criollo and forastero beans. They are cultivated primarily in Central and South America and Indonesia. Trinitario beans produce flavorful, high-fat cocoa. Some are sweet some strongly flavored, while others have an acid edge. The particular flavor characteristics are determined by the soil where the beans are grown. As with the other two main types of cacao beans, trinitario beans have several hybrids and varieties, many of which are named by their places of origin. The men who harvest the pods for crushing, roasting, and pressing. The most moist and flavorful beans come from the plants that are grown in tropical the climates of Tahiti and Madagascar. Vanilla beans have been used as a flavoring for hundreds of years, and it seems so fitting that such an extraordinarily pleasing flavor would come from the fruit of a climbing Orchid Vine! Vanilla which is native to southern Mexico was used by the Aztecs to flavor chocolate, as it is often used today. To use the bean for flavoring, it is split open and steeped in liquid. The tiny black grains that fill the inside of the bean contain the potent Vanilla that is released during the steeping. Vanilla beans will dry out if exposed to air, so keep them wrapped in plastic in a tightly covered dark container and in a cool, dry place. They will stay plump and flexible for several months. The beans will scent sugar, teas, coffees, or other foods when mixed and left to mature, or simmer them with other spices when you are expecting company... your home will be especially welcoming! Produced by steeping vanilla beans in an alcohol and water solution, pure vanilla is concentrated and therefore, only a small amount is needed for flavoring. Vanilla is an expensive flavoring to produce, which has led to the proliferation of synthetically produced vanilla. A substitute for natural vanilla produced synthetically as a byproduct of the paper industry and treated with chemicals. Vanillin is used to flavor some chocolate and candies. Synthetic vanillin is easily detected because it tastes artificial. A measure of the coating thickness of melted chocolate, which determines its ability to coat or enrobe confections. Melted chocolate has varying degrees of viscosity depending on its types (dark, milk, or white) and whether or not it is couverture, which contains a higher percentage of cocoa butter than regular chocolate. Contains cacao butter but does not contain nonfat cacao solids. Mostly used as a coating, it contains sugar, cacao butter, milk solids and flavorings such as vanilla. White chocolate is the most fragile form of chocolate. Imitation white chocolate is made with vegetable oil rather than cocoa butter. One of the famous early chocolate houses in London, established in the late seventeenth century. These establishments were gathering places, similar to coffeehouses. Many supporters and members of the Whig party, writers, and gamblers frequented White’s. In 1787 White’s ceased to exist because it had become a gambling club and been forced to move many times. Finally it had no location. An American manufacturer of chocolate and compound coatings and cocoa powders for the candy manufacturing, bakery, and dairy industries, based in Pennsylvania. Wilbur was founded in 1865 and has been through several mergers with other companies and company name changes throughout the years. The process of removing the outer husk of the cacao bean to release the inner nibs during the manufacturing of chocolate. : The Aztec word for bitter water, a drink made from cacao beans, from which the word chocolate derives.